Using a single, barbed needle borrowed from commercial felting machines, wool fibers are tangled and compacted by repeatedly jabbing the needle into the fibers, forming three-dimensional felt sculptures bound only by one’s imagination. In contrast to traditional felt making methods that use water and friction, needle felting is also known as dry felting. Sculptural Needle Felting is just the coolest thing! First of all the medium is wool ... Let's thank the sheep for growing such amazing fiber. It is really hard to describe the feeling of creating with wool. It must be the organic nature of it that appeals to us; the luster, the smell, the feel ... it really is wondrous stuff. The quiet crunching sound that the barbed needle makes as it pokes in and out of the wool is quite soothing. But the greatest thing of all is the moment that lustrous pile of fluff transforms into a character full of charisma and charm. The needles used for needle felting were not designed for hand crafting - they are designed for industry. At the turn of the 20th century, machines with beds of these barbed needles were invented to tangle fibers into felt fabric. These machines are still being used today to make industrial felt out of a wide variety of fibers. The felting needle is a long, sharp, three- or five-sided barbed instrument. This needle is the tool used for sculptural needle felting. Felting needles come in a variety of gauges from fine to coarse and they vary in the number of sides on the bottom shaft. The sides of the needles have tiny barbs poking out. Store your needle in a safe place when not in use, for instance poke the needle deep into the side of the foam pad. The foam pad is another item you will need. You need this pad to absorb the needle when it penetrates through the wool. The best kind of foam pad to be used for needle felting is high-density foam that is at least 1 1/2 inch (3.8 cm) thick. There is a variety of fibers available and all can be needle felted with some success, but the best material for this purpose is sheep's wool. Sheep's wool fiber has scales on it. When you poke the felting needle into the wool, the barbs on the sides make contact with the scales on the wool and cause them to tangle together; that is the effect you are looking for. 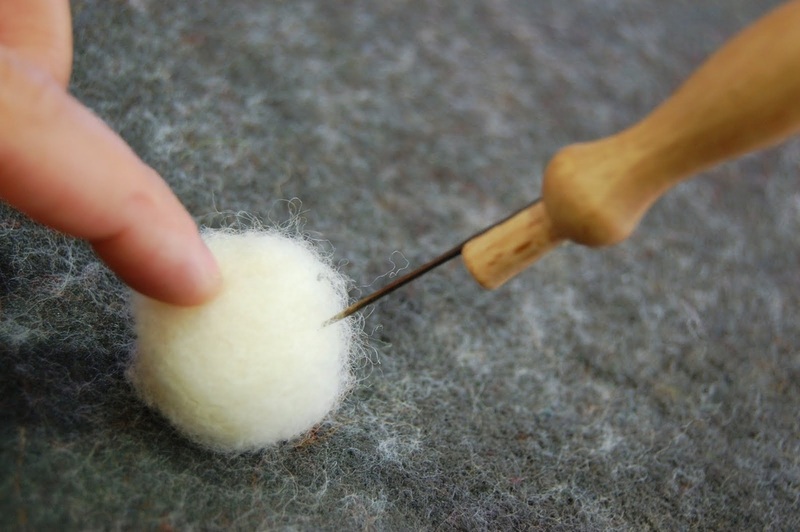 The more you poke, the more compact the wool fiber becomes. Basic procedure: Place the wool on the pad and keep needling without worrying about poking your leg or breaking your needle. 1. 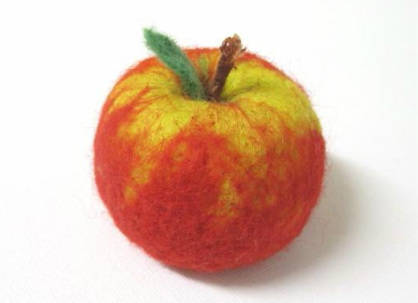 Watch the video on basic needle felting provided here. 2. Obtain the basic materials for your first project: Ball or apple. 3. Make apple or ball. Roll a piece of wool into a ball. Needle the surface. Add more wool to shape the item into a round object. Add some colored wool as needed for design and artistic touch. 4. Submit photo of completed art project, comments and questions.